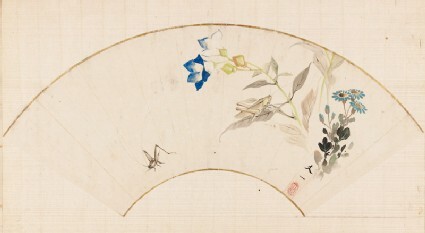 Studies of plants are common subjects both for artists working in the Nanga style of Chinese literati ink painting, and for those trained in the Maruyama style, which emphasized sketching from life. Tani Bun’ichi trained in both styles, first with his father, Tani Bunchō, and later with the Maruyama School painter Watanabe Nangaku. Examples by both artists can be seen in this exhibition [EAX.5387, EAX.5380]. Lit. ‘Southern painting’ – Edo period (1600-1868) Japanese painting school derived from Chinese models.